> Identifies files by reputation, looking for constantly changing code with Insight™. > Monitors application behavior in real time and blocks files with suspicious behavior with SONAR™. > Protects Android devices from malware and provides ability to remotely wipe a device. > Reduces risk associated with use of external USB devices by disabling them completely or enforcing read-only mode. > Protects users on any device, anywhere including: PCs, laptops, mobile phones, tablets, and servers with broad OS support (Windows, Mac, iOS, and Android). 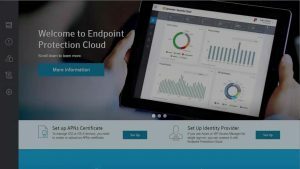 > Combines endpoint protection, management, mobility, and encryption into a single, cloud-based solution. > Creates policies based on users that are seamlessly applied to all of their devices in a single step. > Stays ahead of threats with always-on security that is automatically updated. For any further support and clarification, you can contact Symantec Partner in Pakistan. Symantec customers with valid license support can upgrade their existing SEP 12.1 to SEP 14 version, free of cost. How do I receive my SEP 14 serial number? Wait for the SEP 14 version upgrade (VU) notification letter in email. The notification provides your new serial number and the release details for SEP 14. How do I request manually ? Request a VU notification from the MySymantec.com website. In a web browser, go to MySymantec.com, click Licensing, and on the SymAccount page, log on. On Symantec Licensing Portal page, click Version Upgrade. On Get a License Key for an Upgrade page, click I don’t have an Upgrade Notification ID. Type your customer and order number, and click Submit. Where do I download the SEP 14 software? Can I use my SEP 12.1 serial number to download SEP 14? No. Version 12.1 serial numbers only allow you to download Symantec Endpoint Protection 12.1 software. You can only use the version 14 serial numbers to download the Symantec Endpoint Protection 14 software. Symantec Endpoint Protection 14 is now available! Take advantage of it to stop threats regardless of how they attack your endpoint; so you can focus on your business. Before we get started let’s look at the possible upgrade paths. If you are on a Symantec Endpoint Protection Management (SEPM) Console version 12.x or later you can upgrade directly to SEP 14. In the case of SEPM 11, you can upgrade to SEPM 12.x first then to 14. The SEP client, on the other hand, can be upgraded directly from 11.x or 12.x to 14.0. For SEPM or clients on Windows XP platforms you cannot upgrade to 14 – they are no longer supported. Be sure to perform your upgrade in the following order: SEPM first, then clients that are Group Update Providers (GUPs), followed by the remaining clients. You install the new version over the existing version. The over install process saves your settings and then upgrades to the latest version. You do not need to uninstall previous clients before you install the new version. The over install process saves the client settings and then upgrades the client to the latest version. Note: Clients that are Group Update Providers (GUPs) should be upgraded before other Endpoint Production clients.